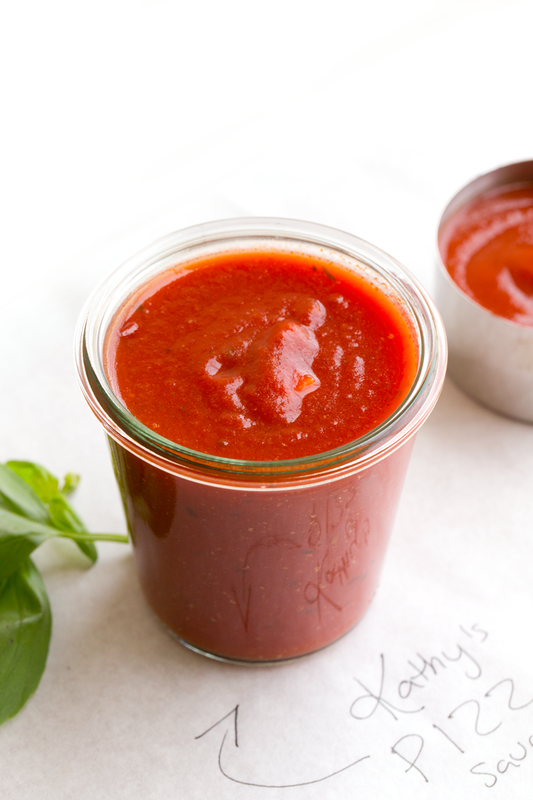 Today, I am sharing my easy recipe for a DIY Pizza Sauce! 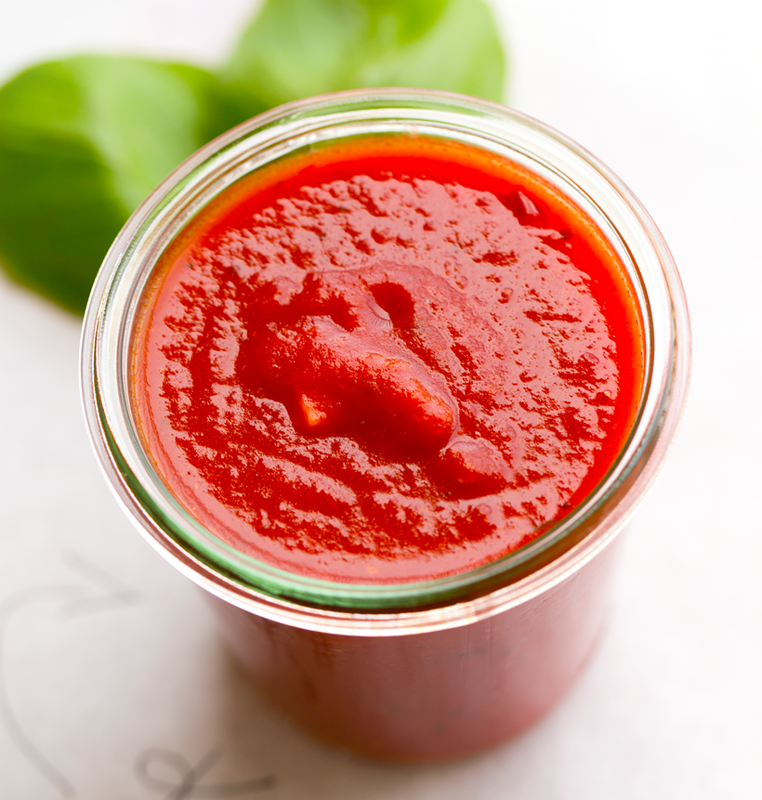 This sauce is vegan, flavorful and can be whipped up in just a few minutes using ingredients that you can keep on hand in your pantry. This thick, herb-scented, warming sauce is better than anything I have ever found in a store. 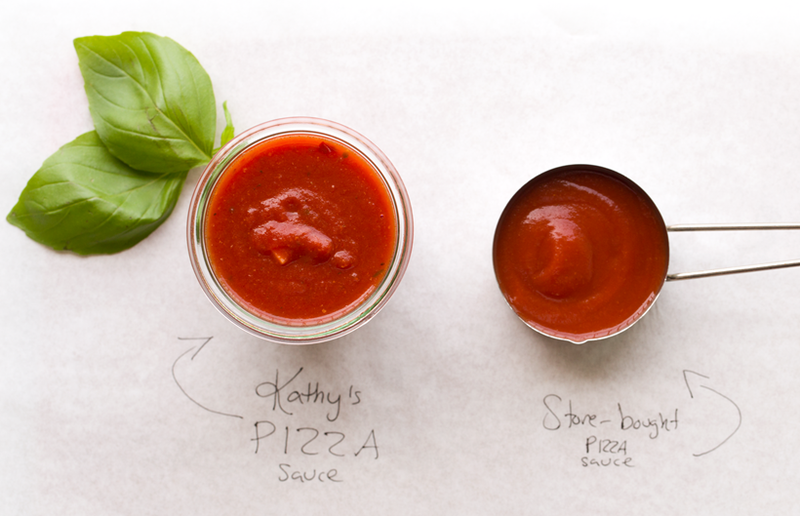 And really, making your own sauce is half the fun of pizza night. Never feel the need to buy a pre-made jar again. You and your family can totally make this in a flash. Get the recipe and stay tuned for more of "pizza week!".. 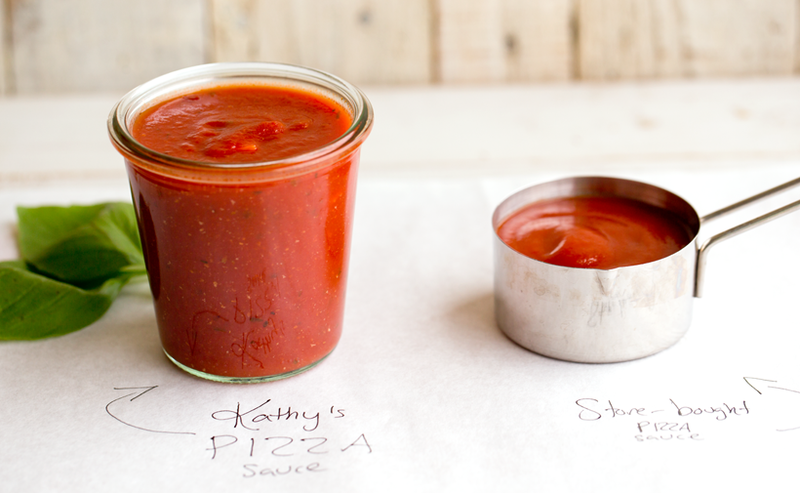 Homemade vs. Store-Bought Pizza Sauce. I wanted to show you guys a comparison of a store-bought sauce and a homemade sauce. You can see, that my sauce has more texture and even a bit of freshly-made fluffiness. Yes, sauces can be fluffy! And when you smell these two side by side there is simply no comparison. And the sauce I bought is actually a more expensive, organic, top-line sauce with very high quality tomatoes! Bottom line: Grab some ingredients. Make your own. Give yourself a gold star. - Sweet. A hint more sweetness. Not overboard sweetness, but enough to caramelize a bit on the crust. - Garlic and onion undertones, along with any other Italian herbs like..
- Texture. Thick yet spreadable consistency - not completely smooth, some varied texture. - Fluffiness! There's that word again.. But yes. Fluffiness from the bubbling and stirring in the sauce pot. - Optional Heat. I like a hint of warmth, so I add in a pinch of red pepper flakes. Pizza Lover. I love a pizza with chewy, bubbly, slightly blackened edges and a thin, crispy-bottomed center crust. I like a generous amount of pizza sauce too. I like to make sure some of the sauce covers the bubbly edges, so it forms this yummy caramelized tomato texture, right over the crust edges. Toppings? Give me alllll the veggies. Minimal or no cheese. I also like pinches of vegan Parm and red pepper flakes on top. oh! And my secret ingredient: a hint of lemon juice. And sometimes actually baking a few lemon slices right on top of the pizza. (I toss the slices after baking, before eating.) Seriously, try it. Over the years my pizza nights have really evolved..
DIY Pizza Memories. 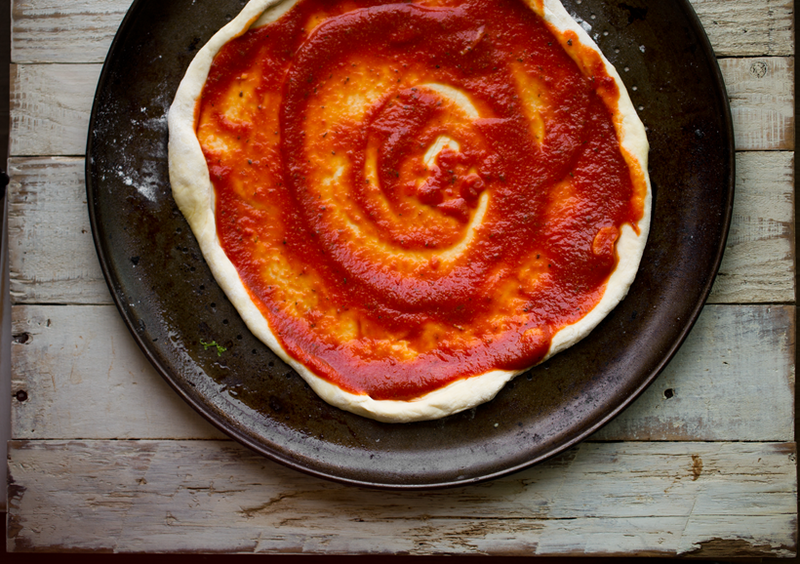 When was the first time you made pizza at home? Can you remember? For me, it was back in high school. I would buy the Boboli Pizza Kit. Anyone remember those?? Do they still even have them? (... I just googled and I think they do... Interesting!) Well anyways, back then, you found the round, cheese-specked pizza crusts, wrapped in shiny, thick plastic, hanging at the end of a grocery store row. And inside the package was a soft, shelf-stable ready-to-bake pizza crust and a packet of pizza sauce. For a cooking-enthusiast teen, it was like DIY pizza magic. It was pretty cool to not have to do much else besides grate your cheese and add toppings. I would get really excited about prepping toppings. Loads of chopped, diced, sliced veggies. I don't remember ever adding meat because those were my "I think I am a vegetarian..." years. I loved being able to make my very own meal, with my very own ingredient choices. ..So the moral of the story is. 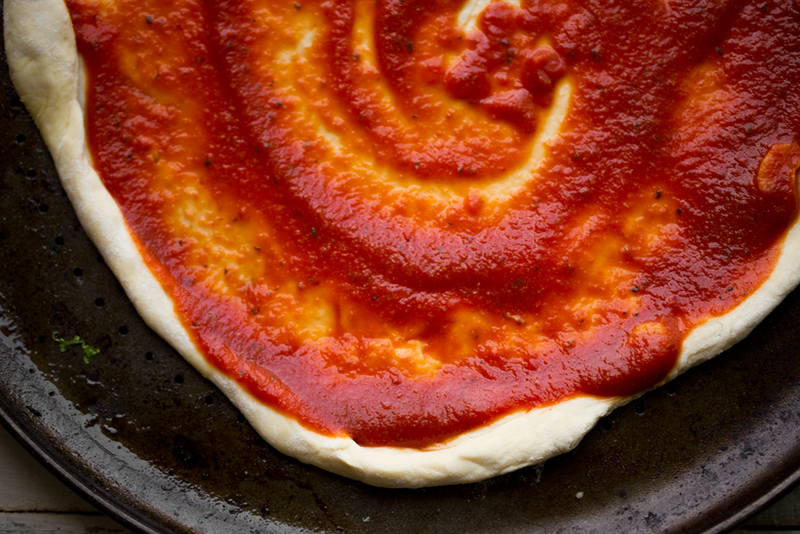 If you love pizza, you will eventually want to try and make it from scratch. And YES you totally can. You just need a few smart recipes and tools. This sauce is the first step. 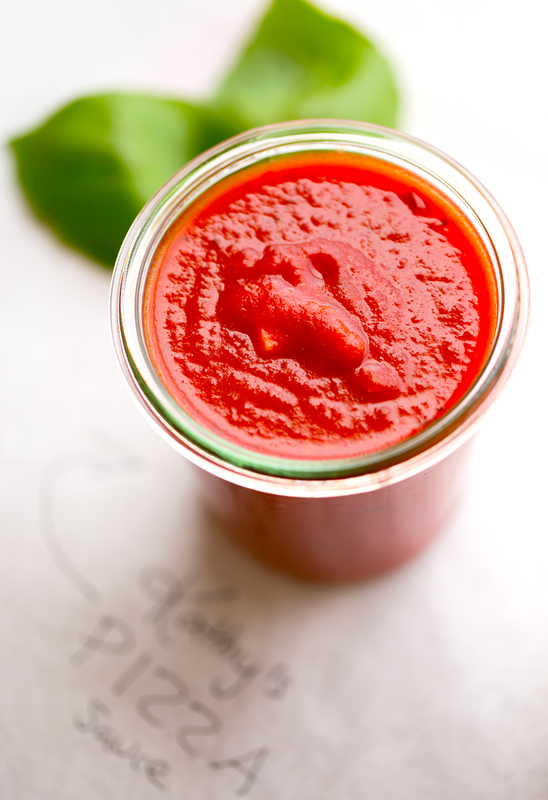 And if you are not ready to do the DIY dough, for whatever reason, you can absolutely use this homemade sauce on a pre-made crust for a DIY component. I will be sharing even more pizza recipes this week, so stay tuned. But for now, here are a few tools I use to make my pizza nights easy and successful!.. - PIZZA PANS. One with holes in the bottom will ensure you achieve a crispy crust and light and bubbly edges too. - My Pick: Bovado Ceramic Coated Copper Pizza Pan 16": Amazon -- This one is great because it is PTFE/PFOA FREE: "This bakeware is 100% food safe and nontoxic. PTFE/PFOA free." ...apparently you guys bought all the pizza pans in stock! But here is another copper pizza pan to check out. Hopefully they will re-stock the Bovado pans..
- PIZZA SLICER. I use a large Chef's knife or my pizza slicer. Both work well. I actually don't think you need a pizza slicer unless you are slicing very large pizzas. OXO is a great go-to for items like this because of their non-slip handles. OXO Pizza Slicer on Amazon. - OVEN MITTS. Make sure they are sturdy and pretty. Kitchen safety first, because oven temperatures for pizza are HOT. Like super hot, 450-500 degrees Fahrenheit. You do not want to burn your hands or wrists. Been there, done that. But wait, why pretty?? Well, kitchen confession here, but I have found that when my oven mitts are in a color I love, I use them more often. I know that's bad because you should always use oven mitts. But sometimes I find myself using a spare kitchen towel or whatever I can grab. Not good. But when my mitts are pretty and eye-catching, I will actually wear them more often. I think it is just by instinct. Who knows. I love my teal oven mitts and pot holders. Here is a similar set on Amazon. - SAUCE JARS. I love these classic glass Weck jars on Amazon. Or these Jervis and George jars. They are actually for baby food, but they are so cute and have colorful tops you can write on. This warming, herb-scented, garlicky pizza sauce has that slightly sweet, always fragrant flavor you look for in a pizza sauce. Easy to make from pantry ingredients. Vegan. Add the tomato paste, olive oil, sugar, garlic, herb blend and onion powder to a small sauce pot. Add in about half of the water. Turn heat to low and slowly warm to medium, stirring the mixture as it bubbles and combines. When the bubbling gets intense, almost to a boil, turn the heat down to low. simmer for a few minutes then add in the remaining water. Continue to stir and let the sauce simmer for a few minutes. Add in 1/4 tsp salt to start. stir well. Do a quick taste test. Add another 1/4 tsp of salt (or more) as desired. 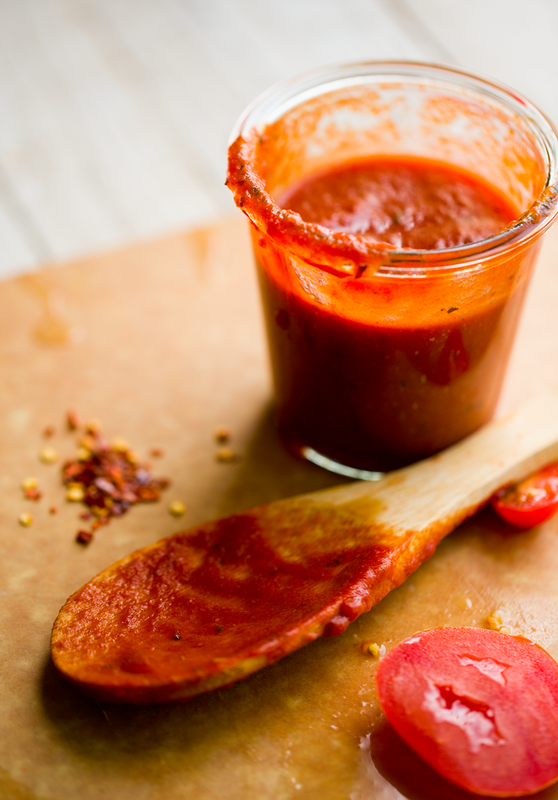 You want your sauce to be bold in flavor - and salt helps bring out those flavors - but not overly salty to where it overpowers the other flavors of sweet and herb and warmth from the garlic. Cotinue stirring, allowing your sauce to thicken. 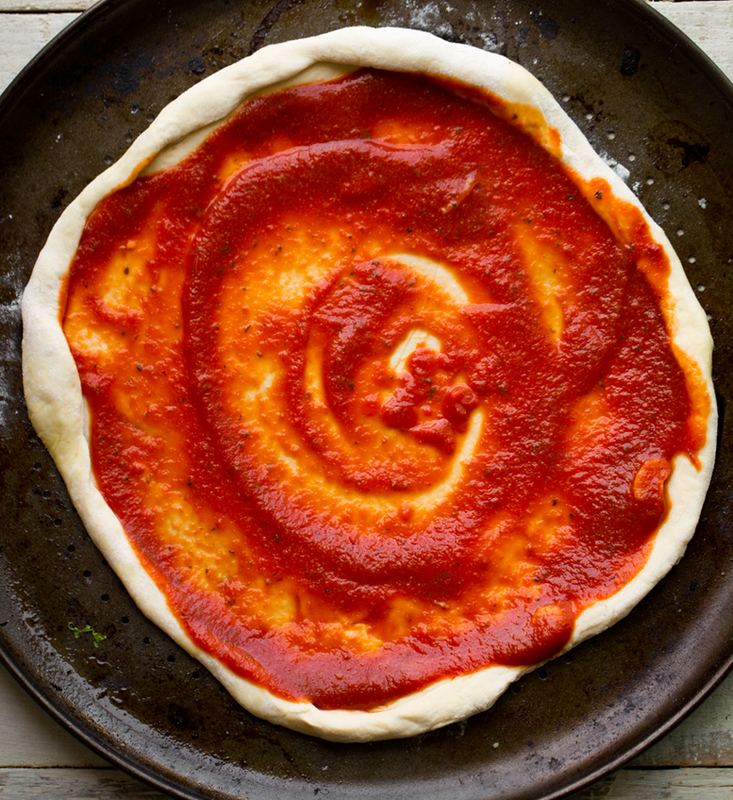 You want it to be about the same thickness as a marinara sauce, only just slightly thicker so it spreads over the dough well and stays in place. Lastly, add in the optional nutritional yeast, pepper flakes and basil. I love the heat the pepper flakes add and the cheesiness and thickening power of the hint of nutritional yeast. When the sauce is to your desired thickness level, turn off the heat. 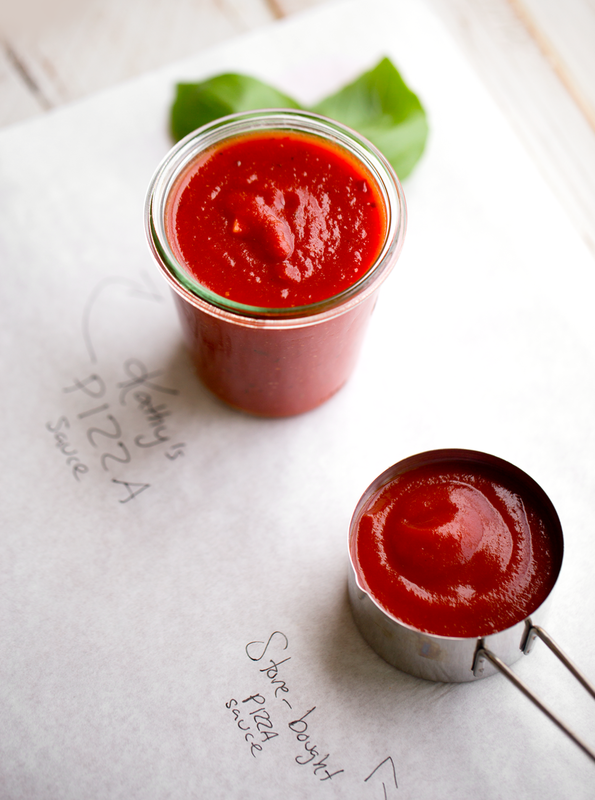 Pour the sauce into a side container and allow to cool slightly before using on your pizza dough. You can also seal the sauce in a jar and use it the next day. 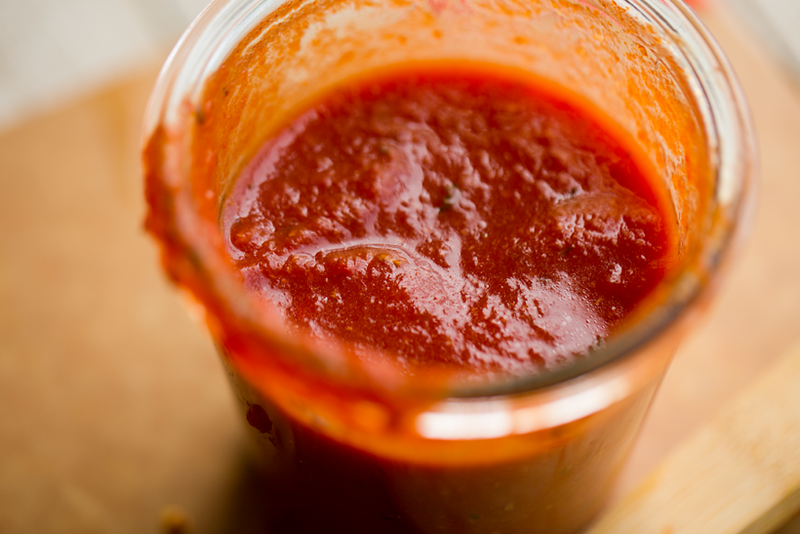 Use your fresh sauce within a few days for best flavor and texture. Note: The Italian Seasoning I used contains thyme, oregano, basil, rosemary, sage, marjoram.